In 8-inch skillet, heat oil over medium-high heat. Add onion, celery and garlic; cook and stir 2 to 3 minutes. Add tomatoes, chili sauce, thyme and ground red pepper; mix well. Reduce heat to medium-low; simmer while preparing kabobs, stirring occasionally. Meanwhile, heat grill. Sprinkle chicken with garlic-pepper blend. Alternately thread chicken, sausage and bell pepper onto 6 (12- to 14-inch) metal skewers. 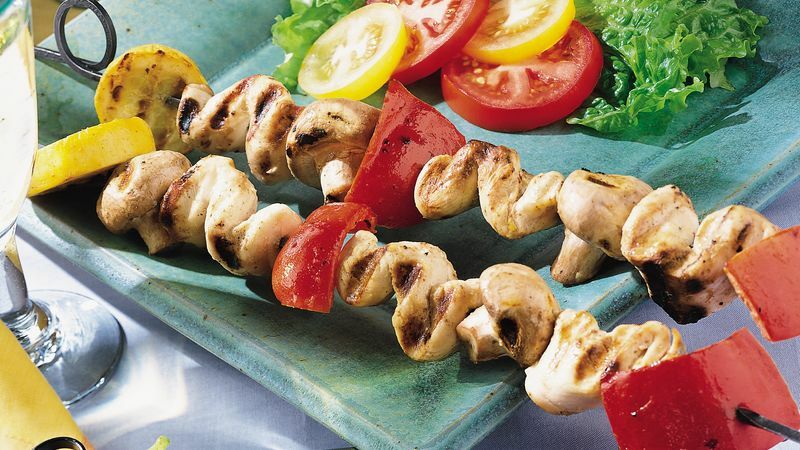 When ready to grill, place kabobs on gas grill over medium heat or on charcoal grill 4 to 6 inches from medium coals. Cook 8 to 12 minutes or until chicken is no longer pink in center, turning frequently. Stir parsley into sauce. Serve warm sauce with kabobs. If desired, serve kabobs with hot cooked rice.